A voluntary military and community cooperative partnership organized to allow service providers to engage in a multi-service networking to assist with connecting Service Members and Families to local military or community resources. To present a single entry point for resources and service providers interested in collaborating with other national and local civic-minded entities in support of Veterans, Military Members, and their Families (VMFs) in their communities. Ultimately, Joining Community Forces endeavors to strengthen pre-existing ISFACs across the United States through a comprehensive strategic communications plan that leverages state-generated content, best practices, and training materials to raise public JCF collaboration and promote the initiative among prospective partner agencies and organizations. 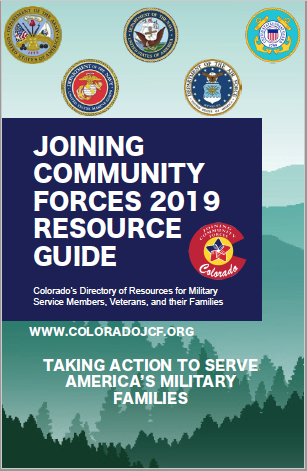 Additionally, the JCF initiative’s mission includes guiding and informing community leaders and local commanders across America on how to establish and sustain collaborative community, state, and regional JCF teams. By building community capacity from the ground up, JCF will enable proactive and effective assistance right where Veterans, Ser- vice Members, and their Families live. Service Members and Families throughout the state can find resources in their own communities.